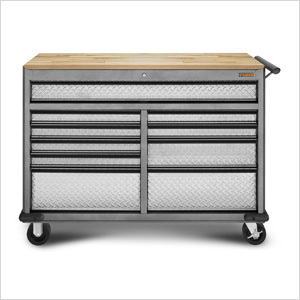 The Starter Series Rollaway Tool Chest with a tread plate finish gives you a workspace that can move where you need it, making it an ideal garage organization solution. You get ten drawers of storage plus a 52-inch worktop made from eco-friendly rubberwood. Like all Starter Series products, the tool chest features heavy-duty and fully welded steel construction with a hammered granite finish.